5 possible loops ranging from 1-6 miles, can be ridden consecutively to create longer distances. Fast trail that requires strength and skill to conquer. Traverses over highest point in region to lakeside. Nine pine log bridges, 3 12" wide raised sections totaling 70', a lot of flow with off-camber descents and full range of turn angles. A: This trail is not more dangerous than any other mountain bike trail. It has good challenging climbs and downhills. There are no cliffs to fall off of. There is some rock and some sand. Review: Man behind the desk at the golf club house told me that some of the trails have been destroyed when cutting trees. Never found where he was talking about. Started on trail 100-200' SW of club house (by stop sign) Rarely used trail (if at all). Two downed trees across the trail before getting off conc. Less than 100' after getting on dirt trail, trail leads off a cliff. Looked like the cliff eroded and fell into the lake. There was a smaller trail that continued further, but it was overgrown with face slappers. It would be fair to say that I did not give this trail much of a chance. That is because I could tell right away that this was not the kind of trail that I would enjoy. I do enjoy a challenge... even search them out, but I do not like trails that are not well marked and/or not maintained. I would not recommend this trail for MTBing. Hope this review helps. Review: Very challenging trail, definitely for more advanced riders. Review: Went spend the weekend at the resort for the sole purpose of riding this trail. Rode a couple hundred feet off of the trailhead and was greated with thorns and over growth. Tried to push through only to find more thorns and over growth. I would not try this trail unless, A. The resort decides to maintain this trail, or B. A hard freeze kills the undergrowth. A big disappointment! Review: First thing is to never do this trail during the summer months. The trail is over grown with thorn bushes every few feet. After I completed it, I looked like I had a mob of kittens attack me. Not the most fun. That and it's hard to see where the differentiating trails and loops go. The trail is also not kept up with much, constant trees where down during the ride. Otherwise, the trail would be much better during any other season. Has plenty of hills for Louisiana and many of them are up. The downhill portions end at sharp turns, there for don't look to this trail for speed. Review: Rode this trail today. It has some pretty hard climbs for La especially in the areas close to the water. There was a ton of dried leaves covering the trail making it pretty tough to make the short steep climbs. Overall it was an interesting trail. Short steep climbs and some decent downhills but not much opportunity to get real speed because of tight twisty turns that kept shutting me down but I was able to get a good workout. Had trouble finding the trailhead so for anyone going make sure you turn in on the road going to the hotel and golf course. The trailhead will be on the right just before you get to the clubhouse. The trail is directional and marked pretty well. Review: Stayed at Cypress Bend with my wife for the weekend. Only got to do one lap of the Hercules Loop on the bike and ran it on foot twice. Several challenging climbs and nice downhills. Trail has a nice flow to it both on the bike and on foot. Loved it. Highly recommended. Review: My friend and brother and I went to this trail thinking it would be fairly short. But that is not the case. This trail is for very serious riders and not untrained riders as we had to walk most of the hills at some point as we did not have the legs for it. It was a good ride but was ruff and we had two flats as it is rocky. So if you ride the trail be prepared for a challenge for louisiana. 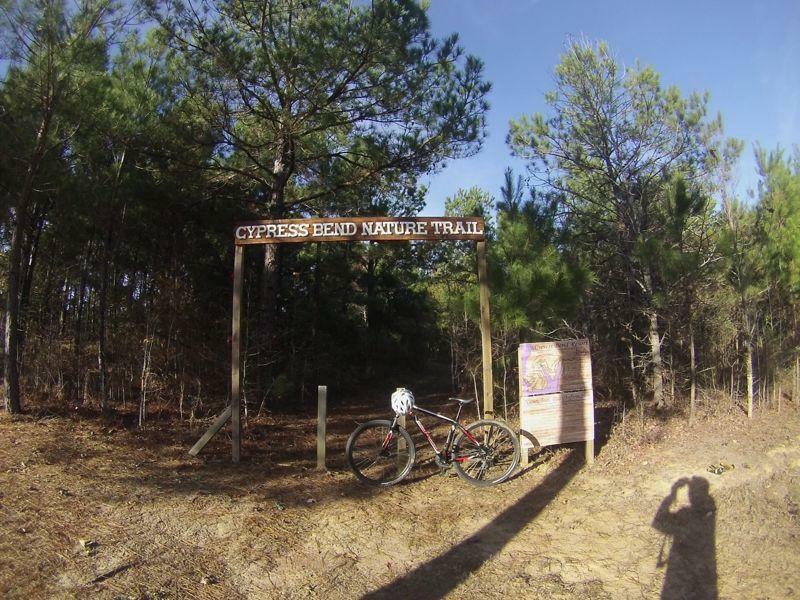 Cypress Bend Resort MTB Trail 2.86 out of 5 based on 7 ratings. 7 user reviews.